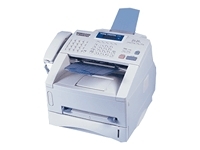 intellifax-4100e Business Class Laser Fax. Fast B&W laser copying at up to 15cpm. Multi-copy (up to 99), sort, reduction, and enlargement (50%-200%). Group dialing (up to 6 Groups). Fax forwarding, paging and remote fax retrieval. Document memory back-up (up to 4-days). Polling and delayed transmission ( up to 50 timers). Telephone handset. External answering machine interface. Electronic Cover Page. 64 shade gray scale.